I interviewed Bruce, a lecturer in Economics at Trent University to get a better idea of what the dispute was about. I think it’s fair to say that Bruce’s views are closer to social democracy than our own, none the less we think it gives valuable insight both to what is happening at the university and across the sector. The views expresses are the interviewees own, rather than the view of the anarchist federation. The interview was conducted in order to try and get an idea of the situation at hand. 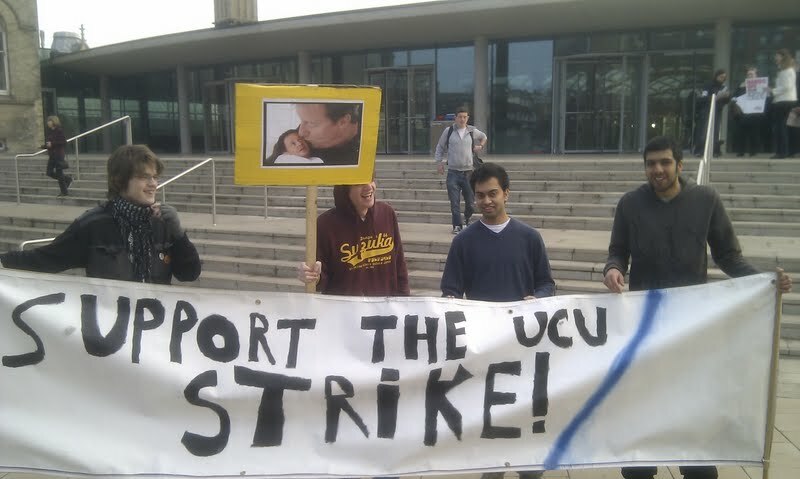 Members of Nottingham AF today were down on the picket lines at Nottingham and Trent universities, as lecturers on strike and as students and fellow workers showing their support. This was following UCU members decision to come out on strike. Where the needs of capital and the needs of us as workers clash, as they always will, we always support workers in their choice to withdraw their labour. A strike is where the implicit tensions between us and them become explicit, where class tensions fissure and manifest themselves. We will support workers who choose this course of action, both inside and outside the union form, where the terms and conditions and wages won by them and generations before them are under threat. Solidarity is our strongest weapon and where there are strikes they should be supported to help people recognise their shared interests.